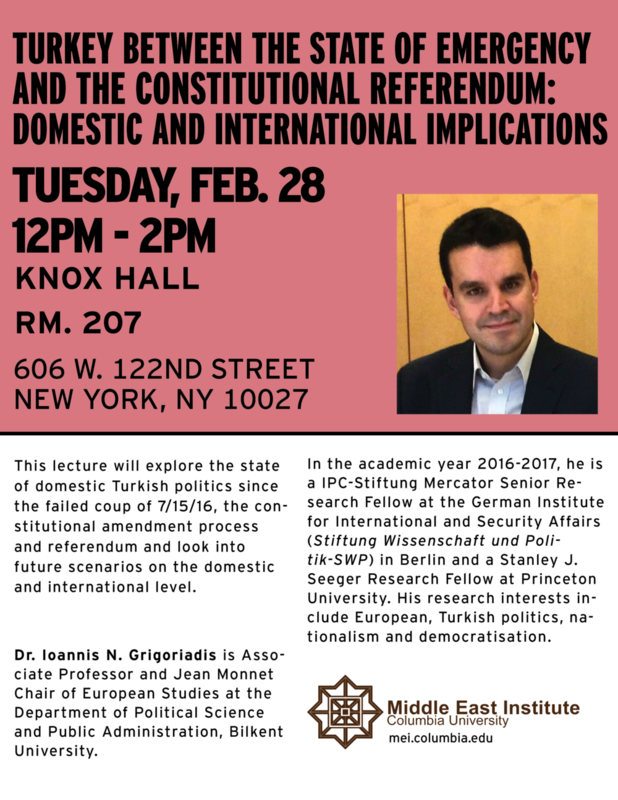 Join us for a guest lecture by Dr. Ioannis Grigoriadis of Bilkent University on the the state of domestic Turkish politics since the failed coup of 7/15/16, the constitutional amendment process and referendum and look into future scenarios on the domestic and international level. *Please note the time for the event has changed to start at 12:30 pm. Dr. Ioannis N. Grigoriadis is Associate Professor and Jean Monnet Chair of European Studies at the Department of Political Science and Public Administration, Bilkent University. In the academic year 2016-2017, he is a IPC-Stiftung Mercator Senior Research Fellow at the German Institute for International and Security Affairs (Stiftung Wissenschaft und Politik-SWP) in Berlin and a Stanley J. Seeger Research Fellow at Princeton University. His research interests include European, Turkish politics, nationalism and democratisation. His recent publications include Instilling Religion in Greek and Turkish Nationalism: A “Sacred Synthesis”, (London & New York: Palgrave Macmillan, 2012), Trials of Europeanization: Turkish Political Culture and the European Union, (London & New York: Palgrave Macmillan, 2009), “The Peoples’ Democratic Party (HDP) and the 2015 elections”, Turkish Studies, Vol. 2017, No. 1, March 2016, pp. 39-46, “The Turkish Presidential Elections of 10 August 2014”, Mediterranean Politics, Vol. 20, No. 1, March 2015, pp. 105-110 “Energy Discoveries in the Eastern Mediterranean: Conflict or Cooperation?”, Middle East Policy, Vol. XXI, No. 3, Fall 2010, pp. 124-133, “Religious Courses in Turkish Public Education: Explaining Domestic Change with Europeanization Theory”, Journal of Church and State, Vol. 56, No. 2, April 2014, pp. 300-322 (with Tugba Gurcel), "Minorities" in Metin Heper and Sabri Sayarı, eds., The Routledge Handbook of Modern Turkey (London & New York: Routledge, 2012), pp. 282-92.